We are fast approaching a season that can literally “tick” you off! I’m talking about (Ixodes spp.) or deer tick! The deer tick is the major source of lyme disease in the United States, with 43 states reporting cases, including Michigan. Up till 2006, 186 known Lyme disease cases have been documented here in our state. The actual disease comes from the whitefooted mouse, which the tick nymph attaches itself to.� The tick then lives off the “host” mouse for about a year. In the spring, those that have reached adulthood, climb onto leaves, ferns, and branches waiting for an unsuspecting warm body to pass by! That’s where you, or even your dog, comes into contact with these lyme disease carriers. Friday the 28th of March will go down as “A day of Infamy!”� Well maybe it’s not quite that “historic,” but it defiantly will go down as a “bummer!” This picture was taken out my dinning room window into my backyard on the 8th. day of Spring 2008.� Unless your “Nanook of the North,” this is not what you want, or expect, this time of year. � My mother, bless her Canadian heritage, loves this “white” stuff, but if it’s not a November or December tracking snow, I don’t have to have it.� My turkey permit is just three weeks away, and I sure don’t plan on tracking one “in the snow!”� I’m tired of blogging about these late season snow accumulations.� Every time we get one I proclaim it to be the “last!”� No proclamations this time, as I don’t want to be wrong again! I just received an e-mail from one of my Canadian cousins from Calgary Canada, and even they “don’t” have any snow!� Something is wrong with this picture.� Not that it isn’t “pretty,” but tulips, trees budding, and robins chirping are also “pretty!”� Speaking of robins, I heard they are taking up a petition to become the Georgia State bird, and they want the “snowy owl” to take their place here in Michigan!� I think the robins are having a hard time finding any worms beneath the snow cover around here, and my wife can’t find her tulips either! Chris James, from Horton Michigan, shot a giant of a whitetail this past October.� Chris shot a 24 point non-typical buck while hunting his favorite swamp in Jackson county with his compound bow.� Preliminary reports stated that Chris’s buck could possibly be a new state record for bow-bagged bucks!� From that point on, details of this mysterious deer, dried up like a pot-hole on the prairie!� Rumors began to circulate that something was “rotten in Denmark” concerning the deer being legally harvested. I found out a few days ago that the Department of Natural Resources completed an investigation on this whole matter, and Chris is now getting more P.R. 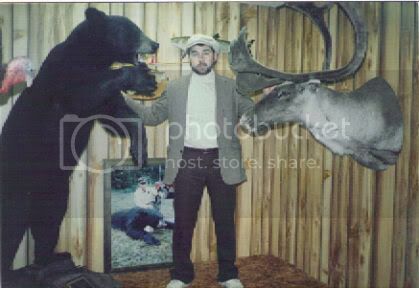 about his deer!� It no doubt is not the type of publicity he was hoping for, as this past Monday Chris pleaded guilty to various game law violations. When Chris shot the buck on October 24th. it was the “buzz” of the community, and the local paper did a write up on Chris’s good fortune.� It seems that Chris did not have a license , at the time, so next day he purchased one.� When the interviews, royalties, and endorsement offers started rolling in, I guess Chris wanted to make sure the “record” showed he was “legal!”� Little did he know that conservation officers can add, subtract, and even multiply!� When a team of agents did a check on the computerized license records, it showed James had purchased his license a day after his newspaper interview. Could this possibly be a picture taken On Easter? I’m afraid so! We got 7 inches of snow starting on Good Friday, and ending Saturday morning. 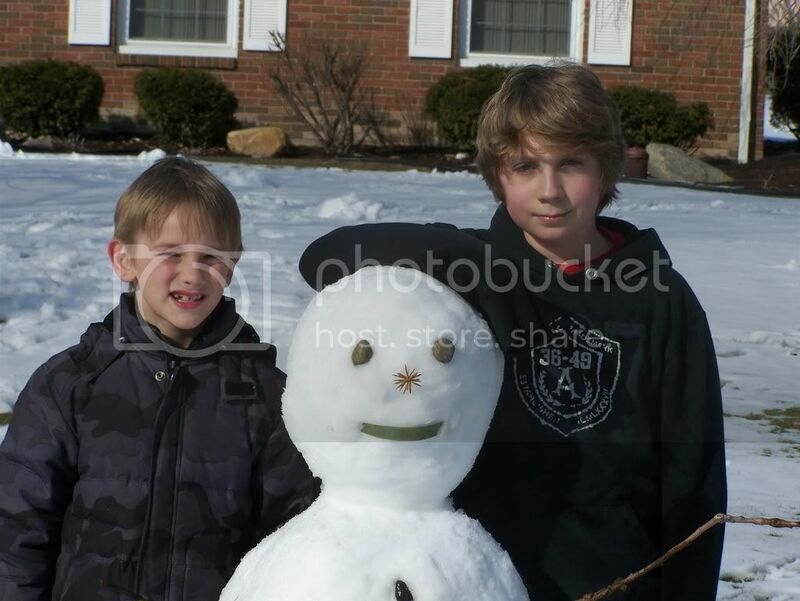 I’m getting tired of saying “this has got to be the last snow of the season!” Monroe surpassed it’s all time record for snow with this last “blizzard!” Two of my grandkids Quinn and Keegan built this snowman Sunday after our big Easter meal, and then we had a little snowball fight. I’m telling ya I’ve still “got it!” I’ll bet I hit those two with 85% of the snowballs I threw, while they only got me twice. At one time I hit Keegan five times in a row, as he ran for cover! Who would of ever thought We would be having snow ball fights at the end of March? To think turkey season is just around the corner. I’m glad I got the second week. 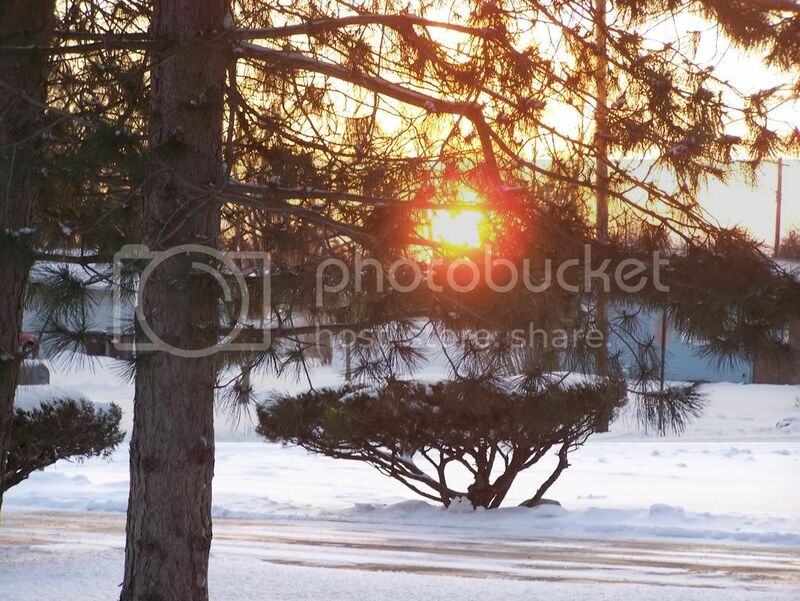 Maybe� it will quit snowing by then! The final statistics have been released by the Michigan D.N.R. concerning the 2007 bear season. For the seventh year in a row bear harvest figures have topped the 2,000 mark. That being said the 2007 figure of 2121 bears tagged is the lowest final tally of those seven years! Sometimes weather plays a huge roll in the number of bears harvested, and it certainly played a roll last season. For most of the bear season the weather was unseasonably warm which kept the bear from being real active. Also there were quite a few severe storm’s that “raked” the Upper Peninsula, along with generally heavy rains statewide! This situation kept alot of hunters out of the woods. There were around 55,000 bear hunter applications last year with 11,250 tags handed to the “drawing” winners. Michigan boast a population of between 15,000 and 19,000 black bears with 90% of that population being in the U.P. 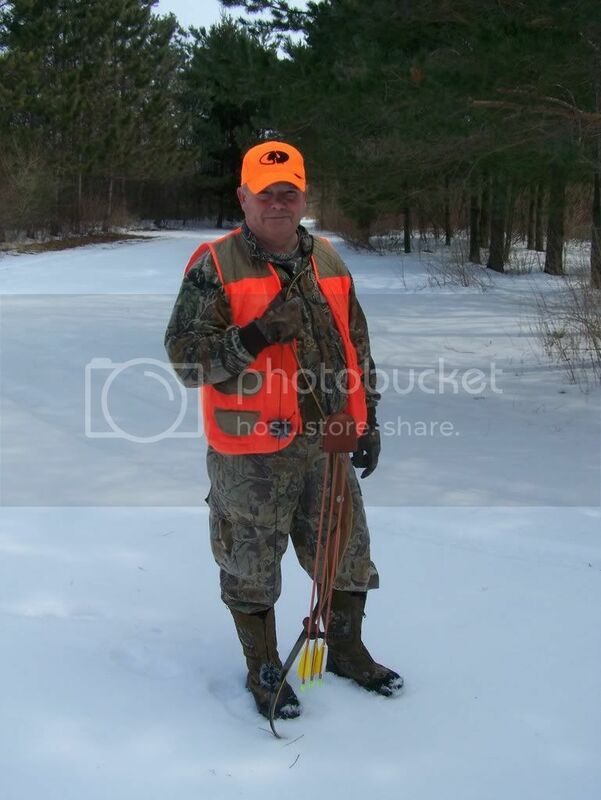 The success rate for Michigan hunters seems to stay right around the 25% range, which isn’t that bad of a statistic! The Newberry unit had the highest harvest rate of any unit, and is usually right there at the top of the successful units list! My brother and I (camera man) ran into the heat, and also the rain and wind. It can be a cool sunny day, but if that wind is blowing like crazy, those bear are very “spooky” and wait for the wind to die down, before they make any serious forages. We had three baits being hit, but seen nary a black bear. At least we know there are still bear in the area for next year. Just a few more facts concerning Michigan’s bruins. Mature females usually weigh in between 160-250 pounds, and males between 150-400 pounds according to the D.N.R. The Ansel brothers have topped that statistic on three occasions, with the bear in the above picture weighing in at 500 pounds. Brothers Darryl and Dean also have taken bear over the 400 pound mark. A bear can live to the ripe old age of 30, but of the more than 40 bear we have harvested, the 13 year old (pictured) is the oldest! A female reaches breeding age at 3-1/2 years old, and she can have 1-4 cubs. We have seen cubs weighing around 40 pounds, but a few times have had little 8-10 pounders in our baits. One mother we observed had four little furballs with her, and she didn’t look much bigger than the cubs. Here is a statistic that comes strictly from our observations-of all the bear (hundreds) we’ve seen, only three have had the white chest “V!” Where we hunt color variation is virtually non-existent! Only one bear we ever harvested had any markings rather than jet black. Mark Davison (family friend) arrowed one with some brown mixed into his thick black coat several years ago. Don’t forget the bear application period will be May 1st. through June 1st. And oh by the way “Merry Easter!” Daughter Meghan just called and they have 12″of snow in her northern Chicago suburb. We are expecting about 8″ here. Not a good way to start “Spring!” Seriously I hope your Easter is blessed. 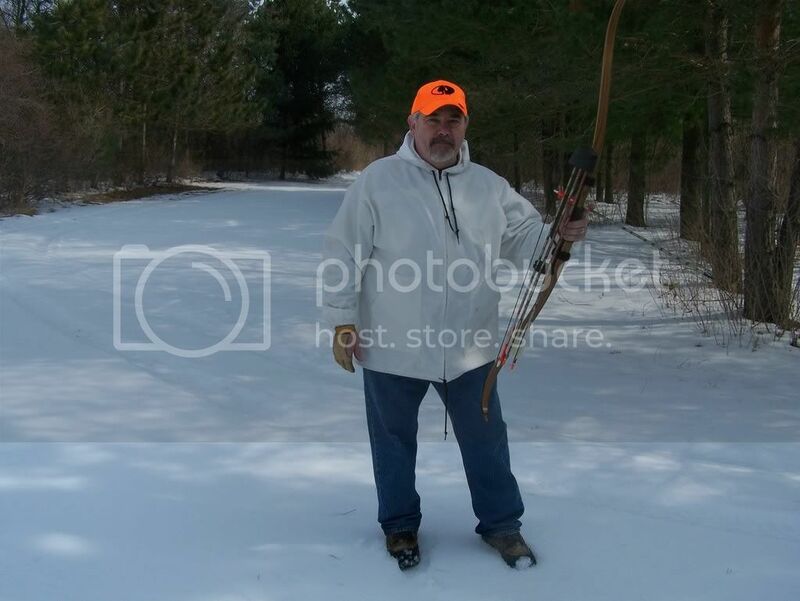 Yesterday I took a drive over to Hillsdale County to look at a piece of property.� I arrived at my destination just after 10:a.m. and drove the back roads in the area, just to familiarize myself with the lay of the land.� As I passed one winter wheat field my eye caught movement from a little swale in the middle of the field.� Out walked a turkey, and then another, and another, until there were 35 of them pecking the ground.� I put my “glasses” on them and focus on several big “Tom’s!”� I had my movie camera with me, and took some video of the flock, but forgot to take any snapshots!� A little further down the road two deer jumped in front of my truck, and the tracks in the dirt road told me this was a “hot” area.� I also saw an eagle circling overhead, and the geese were in most every pond that didn’t have ice. 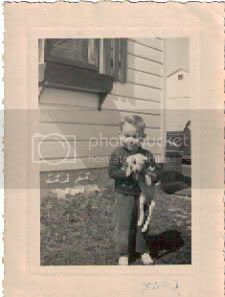 This is my very first dog “skippy!” Actually I don’t remember much about the dog, except for the dog poop we had to dodge while playing in the back yard. Our next dog was a cocker spaniel named “blondie,” by my mother. I don’t remember an awful lot about her either, except for the day she died. We were playing outside our apartment, and blondie was chained to her dog house. I remember my mother was doing laundry in the basement, when suddenly the dog started barking and jumping all over the place. One of the neighborhood boys got too close, and Blondie tried to bite him. My mom heard all the commotion, and came upstairs to find the dog foaming at the mouth, and barking it’s head off. A couple of the neighbors came around, and they cautioned everyone to stay clear of the “mad” dog! My dad was at work, but just across the street, from our apartment, was a Justice of the Peace office. There happened to be a state trooper in the driveway, and one of the neighbors went over and got him. After checking things out he said the dog was dangerous, and he’d have to shoot him. The trooper made us all stand back, and right there before my 6-year old eyes he shot our dog! I’d never heard a pistol go off at close range, and I certainly never had something I loved , shot and killed, while I, my mother, and my brothers watched helplessly. It was quite traumatic for us all, and my dad was pretty upset when he got home. My dad didn’t think that was the way for the police to handle the situation, and I remember him going over to the J.P.’s office, next time a state trooper was there, to give them a piece of his mind! It took us awhile to get another dog, but our next one was just what we needed. My dad picked the runt, from a litter of English setter/Irish setter mix puppies. She became family, and was with us for almost 14 wonderful years. Not only was she the best bird dog in Monroe County, she was a watch dog, and friend to boot. Her name was “Flopsey” and one of these days I’m going to devote a couple blogs to that “once in a lifetime” dog. Happy St. Patrick”s Day to all you that are Irish, and also to those who wish they were!� This is one of the few old pictures we have of my grandfather Gorden “Kelly” Greer.� A true Irishman if ever there was one.� He’s holding my brother Randy, and that’s my Aunt “Dode” with two of her boys Tom (standing) and Greg.� This picture was taken on Spring St. in Sault Ste. Marie Canada.� My grandmother Irene (Kelly’s wife) died 16 years prior to this picture being taken.� My grandfather never remarried, and had to have alot of help in order to raise his six children.� He was well known, and much loved around the Soo, and a bit of an “Irish Character” to boot! On St. Patrick’s day Kelly would dye his snow white hair green, along with his full white beard.� One year he visited us here in Monroe, and I remember that “way cool” green hair and beard.� Also on Orangeman’s day he would dye everything orange, which was a bit more controversial than St. Patty’s green!� Kelly was of the Protestant persuasion, and didn’t mind flying his colors, so to speak.� One year during our Monroe County fair week grandpa Kelly was in full “white” regalia!� I remember all the little kids thinking he was Santa Clause, and how excited they would get, when he stopped to ask them “if they were being good for their parents?”� To top it off he usually had a Irish briar bowl pipe clamped between his teeth, and always had an impish grin on his face. My Grandpa Kelly never possessed earthly riches, but he was a “RICH” man!� He never wrote a book or earned a degree, but he was wise beyond belief!� He wasn’t a CEO, nor did he command multitudes of people, but he was loved and admired by all who knew him!� No town, nor building, nor street was ever named after him, but he was a hero to his family and friends.� He lived in a very small apartment at the Y.M.C.A. but always considered himself “blessed”, and reached out to the “less fortunate” by any way he could.� He was know to give away more than a few silver dollars to help out an acquaintance, friend, or family member. Oh how much this “crazy” world needs you now Grandpa Kelly.� In fact it needs an infusion of men the likes of Gordon “Kelly” Greer.� I wish I would of had the opportunity to be around you more often growing up, but your daughter (my mother) is caring on your legacy of hope, caring, and sharing with those around her.� You might say she’s the last of the “Mohican’s” this bonnie lass Betty Louise Greer.� So on this day set apart, for those that live their lives in order to “bless others, I honor you and your heritage of love and caring. While I love the snow, and the pure fresh picture that it paints on nature’s canvas, I am ready for it to melt, along with “Frosty!”� It can come again another day-like next year when I need it to track a big rut crazed 10 pointer. � Until then though, let the sun shine in!� This picture was taken less than a week ago, but right now the snow is almost completely gone from my yard.� Yesterday’s upper 50’s felt wonderful, and today’s 40’s should finish off “Old Man Winter” for this year.� I saw my first robin yesterday, and my wife has been seeing them for several days-welcome back my feathered friends.� Now that is a sure sign of Spring!� My wife’s tulips are even starting to crack open the soil, a wee bit. We met and had a good hearty breakfast, and I’ll be dog-gone if that sneaky brother of mine didn’t beat me to picking up the “tab” AGAIN! How does he do that? He always was smarter and faster than me-wink-wink! The first place we tried was my son-in-laws where I always see rabbits-when I’m not hunting that is! You guessed it, we didn’t see any fur, except for the spot where the fox was more successful than us! He had also taken a rooster pheasant in the same area. We should of been fox hunting! My brother said he had a friend just down the road, where the rabbits were chasing his dogs around his yard. I couldn’t wait to finally fling an arrow! His friend had about 20 acres, and we walked 10 of it kicking brush piles, walking through brier patches, and going through the ice (up to my knees!) I don’t get it; my brother walked across the same creek, and he didn’t go through! Then low and behold, just before we’re ready to call it quits, I draw blood! Of course it was dripping off my hand, where the three 1/2 inch long briers were embedded in my skin! “Ouch” that hurt! I’ve had enough for one day, but have a brilliant idea, as we pass by a set of archery bales. I say “Hey little brother why don’t we each set our hats on these bales and take a 20 yard shot at one another’s hat?” I don’t suppose any of you have ever come up with anything like that-yeh right! Anyway Darryl has a new orange hat, and I have my favorite Cabela’s hat, but neither of us thinks the other will hit the mark – especially at 20 yards with a recurve. Darryl tells me to shoot first, and “whack” I send his hat flying! I’m tickled “pink” (I mean camouflaged) and am laughing my head off when he draws back and “smack!” We walk up to the hats, and I never knew a “smack” was better than a “whack!” He drilled the bill of my hat (off center) and put a nice hole through it. I hit his hat dead center, but my weakly thrown broadhead never penetrated his bill, just a teeny, weanie, little, girly, dent! How humiliating is that? Oh well it was still good to spend the day outside, and not be frozen, even after going through the ice! I’ll just about bet though that this was my last rabbit hunt for the year, but I’ll still do breakfast Darryl!